Some materials are special not for what they contain, but for what they don’t contain. Such is the case with metal-organic frameworks (MOFs) – ultra-porous structures that are being developed for a variety of future applications from fire-proofing to drug-delivery. MOFs are, in fact, the most porous materials known to humankind. One metal-organic framework, so-called NU-110, has such a large surface area that just one gram of it could be unfolded to cover one-and-a-half football fields. That huge internal surface area is a result of the atomic components – metal atoms linked together by organic molecules, forming a cage-like structure. It is by tinkering with the chemistry of these cages, and by inserting different objects inside them, that scientists are able to contemplate so many different applications. ‘By judicious choice of the metals and linker molecules, there is a huge number of materials that can be prepared with properties designed for specific needs,’ said Dr Ross Forgan of the University of Glasgow in the UK, who is exploring metal-organic frameworks for cancer drug-delivery. Most chemotherapy drugs end up affecting healthy tissue as well as the tumour, hence the well-known side effects of nausea, kidney damage and hair loss. To try and solve this, some ‘passively targeting’ treatments are based on nanoparticles in order to capitalise on the fact that tumours are better than normal cells at retaining nanoparticles. Dr Forgan’s goal is to go one better and actively target tumours. Cancer drugs can be loaded into metal-organic frameworks, while the MOFs themselves can be designed to specifically latch on to tumours. Active targeting means that all the drugs end up at the door of a tumour, so generating fewer side effects. It also means doctors can apply drug treatments that are usually too powerful to consider. Currently, Dr Forgan and his colleagues are developing the chemistry of metal-organic frameworks, using DNA and other molecules, to make them latch on to tumours. Meanwhile, they are developing methods to make the MOFs that are fast, adjustable and repeatable – all key requirements for clinical testing. This year, they made a crucial discovery: that the cytotoxicity, or effectiveness, of cancer drugs is largely determined not by their quantity, but by the specific mechanism by which they are taken up. In fact, adjusting this mechanism with metal-organic frameworks has allowed the researchers to boost the cytotoxicity of simple anti-cancer molecules roughly 100-fold. Metal-organic frameworks have been touted as saviours for almost everything. Potentially, they could store hydrogen for clean-electricity generation, perform artificial photosynthesis and even detect chemical weapons. At the IMDEA Materials Institute in Madrid, Spain, Professor De-Yi Wang is exploring a potentially more widespread application: fire-proofing. Current fire-retardant materials are based on organic molecules containing phosphorous and, although effective, these are bad for the environment and tend to compromise the stiffness of whatever surfaces they are applied to. On the other hand, a metal-organic framework can actually improve the mechanical properties of a surface. It can also contain a flame-retardant compound, but use less of it to generate the same protection. ‘We can improve the flame retardancy in a more environmental-friendly way, without sacrificing the mechanical performances – or even improving them,’ said Prof. Wang. When his flame-retardant metal-organic framework is exposed to fire, Prof. Wang explains, instead of burning it simply chars, protecting whatever lies beneath. So far, so good. But issues remain, such as the fact that metal-organic frameworks are not very stable in water – a problem if, for example, scientists want to incorporate them into water-based, fire-retardant paints. 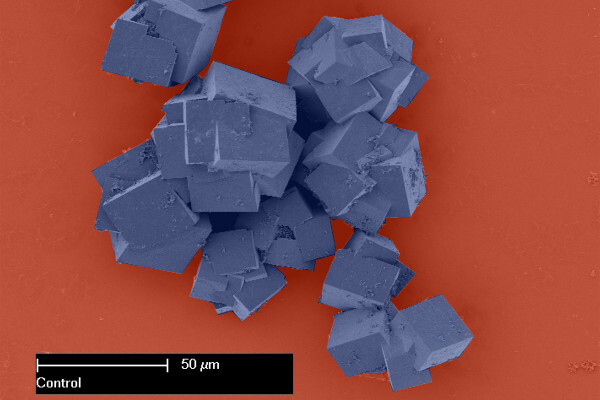 Prof. Wang thinks the answer might be to coat the metal-organic frameworks with surfactants – detergent being a common example – to help them stabilise and mix with water. The good news is that the particular MOFs Prof. Wang and his colleagues are using can already be made quickly and in large batches, which means that a low-cost route to industrialisation looks feasible. ‘Many thermal-plastic types of polyester in our daily lives could be endowed with flame retardancy and other functions, such as reinforced mechanical properties,’ he said.